I have now started the Talon and Chantry novels. First up is Borden Chantry, available at Amazon, Barnes and Noble, and BooksAMillion. Borden Chantry never wanted to be a marshal: he'd planned on wearing the badge just until he could raise enough money to buy cattle. But he was good at his job: riding herd on horse thieves, drifters, and drunken cowpokes. Now a well-dressed stranger lay dead in the street, apparently the victim of a cold-blooded murder. With few clues to go on, Chantry knows only one thing: the killer lives in his town. But what can it be? Time Reader, the ruthless saloon owner: Hyatt Johnson, the greedy banker? Mary Ann Haley, the town courtesan? And the closer he gets to the truth, the closer Borden gets to becoming the next victim. My grandfather used to read me to sleep when I was little and this book was read when I was maybe four years old so the memory is fuzzy around the edges. I honestly can't say if I figured out the killer so quickly because I remembered from the original reading or if the killer was just that obvious. 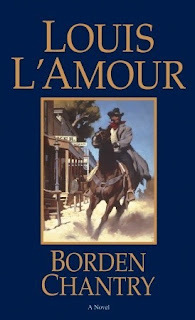 I did pinpoint the killer the third or fourth time that the character appeared in the story, which was closer to the beginning of the book rather than the end, but I may have known what to look for in this western whodunit. I did enjoy the story, maybe because I associate the book with my grandpa. Parts of the story read so much like the dialogue of old TV westerns (which were frequently playing in the background of my childhood) that it's hard for me to not be nostalgic about this book.